He was snug and fast asleep as we laid him on the bed. I was exhausted, hungry and every part of my body ached. It seemed quite normal to proceed to do something I usually did when tired- head straight for a hot, relaxing bath. They say babies have the ability to know when their mother isn't around. Call it sixth sense or magic but it was at that very moment that my very silent baby suddenly began to scream so loud and every ache I had suddenly vanished. It was that exact moment! The moment I knew it was no longer just me and my wants or needs but a greater responsibility that required me to be selfless and quite literally the last on every list. I could sit for hours feeding my baby and never utter a single word or complaint of discomfort because my baby's comfort was of primary importance and all that mattered. I learnt to shower and be ready in ten minutes, all while insanely imagining that I could hear my baby cry, wondering if I should abandon whatever I was doing and rush out. I was able to sleep with my eyes (literally) wide open and wake to the slightest of movements. It was indeed a transformation because I could sleep through an earthquake and only awaken to the sound of my alarm clock. I became as 'fearful as hell' and panic had no bounds for the first few days. Was I holding him the right way? how would I change his nappy, or bathe him? Every time he cried I felt my heart beat faster and whenever I figured out what his cries meant, the mommy in me jumped for joy. I could quickly and sometimes while holding my baby eat the most unimaginable foods simply because they were the most nutritious and healthy for my baby. I no longer felt tempted to eat that hot, spicy chaat or delicious cheese filled pizza. All guilty food pleasures were somehow easily erased in those first few months after birth. I suddenly began to cry at the drop of a hat and not because I was watching a movie. Anything that involved children could somehow pull the strings of my heart and make me hug my son a little tighter. I became an expert in talking about anything 'baby related' and aways looking for other mommies who would relate to my state of mind. It became quite normal to ask questions like "how old is your child"? or make statements like "Oh! That reminds me of my son" or " Let's arrange a play date". I felt helpless and emotional if my son was in pain and yet I knew this was just the beginning of learning to be brave. 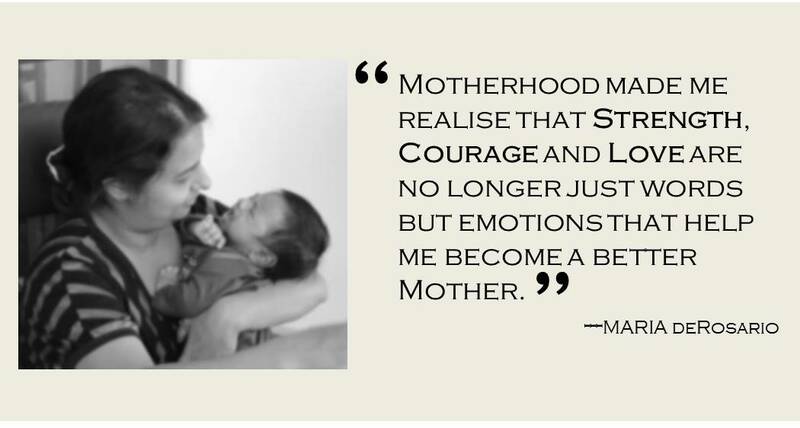 Motherhood made me realise that Strength, Courage and Love are no longer just words but emotions that teach me to become a better mother everyday. It's taught me something new everyday and as someone rightly said: "Becoming a mother is learning about strengths you didn't know you had and dealing with fears you never knew existed.."
As we drove to the hospital that night, silent and full of anticipation, I don't think I even realised that this was just the beginning. I agree!! I use to sleep much deeper...not that I have mom sense I wake to the tiny sounds! Aahh..sleep😊 what IS that? Lol. Thanks much for taking the time to read. Oh yes, all of that is so true. Thank you for sharing your thoughts and reading. Crying at a drop of a hat. Yes. I have been doing that. That happens with every child! The Blogger Mommie is Proud to Feature Kerry!